Learning about my family tree branch from...Switzerland???? Compared to all the family trees I've worked on over the years for clients, I find my own tree...well, just a little mundane. I am English, German, Irish and just a tad Danish, which has always been the "exotic" part of my heritage, and on top of that, most of the English side was already mapped out before I was even born...what's the fun in that??? Lately, I've been doing a lot of digging on my German lines. One of my better established ones has been the Stutzmanns, my grandmother's family, which I've reliably traced back to the Rhineland region of Bavaria, to a village called Grossbockenheim, and a nearby village of Asselheim before that. I used microfilmed copies of, for the most part, primary German records to do that, but every time I did a Google search, another wide-reaching research net I like to throw out every now and then, my results for Stutzmanns always came back Swiss. Not only Swiss, but Pennsylvania Amish and Mennonite...a well-documented Amish progenitor was Christian Stutzman along with his wife Barbara Hochstedler/Hochstetler - if you ever saw the Katey Sagal episode of Who Do You Think You Are?, she is descended from them. So I always wondered if there was a connection between my Stutzmanns and the Swiss Stutzmanns, but all my own research only led me further back into Germany. And then....I got a DNA match through AncestryDNA with a descendant of Christian Stutzman. But since I couldn't get my Stutzmanns back to his Stutzmans, I couldn't prove that THAT was the line we were connected through. I even wrote about it on this blog...and then this past week, that post got a comment from someone who said to check a Swiss Amish association website because the Stutzmanns emigrated from Switzerland to Germany in the early 1700s. Well, that's nice that he assumed there was a connection, but my German roots were very deep - my Stutzmanns were German. But since I've been on a German research kick, I decided to take another look at my research. Yup, I could get my Stutzmanns back to a Johannes Stuzmann, whose son Peter was married in Asselheim in 1731. Peter died there in 1780 with an estimated birth year, according to his death record, of 1712, which would make Johannes' estimated birth year about 1685. But though I knew Peter was married in Asselheim in 1731, I didn't know where he was born in the early 1700s, and I didn't know where his father Johannes was born in the late 1600s....COULD they have NOT been born in Germany? When I was searching through German records, I couldn't get any further back than Johannes. I went back to my AncestryDNA results and did a surname search through my matches (my research may sometimes seem all over the place, but there is a method to my madness! ), and found TWO more connections who were descendants of Christian Stutzman. That seemed more compelling than one match that, indeed, Stuzman(n) was where we were connected. So I did a Google search for Stutzmann and Asselheim and came across a blog post over at DNAeXplained - Genetic Genealogy, where the author is loosely related to the Pennsylvania Amish/Menonnite Stutzmans...and my Peter, baptized Johann Peter Stutzmann, is there! Except his father is listed as Johann Christian Stutzmann, not Johannes Stutzmann. But it's the village where MY Stutzmanns lived, until at least the 1770s on my branch and the 1840s on ancillary branches. And on this blog post, which is extremely well documented, as well as all the documentation I've come across, I've only seen children in the early 1700s born in Asselheim to either Johannes or Johann Christian Stutzman(n), both with a wife named Maria Margaretha...and I've only found records pertaining to the one Johann Peter. Well, it's interesting because this particular blog post is about the author trying to clear up a mystery surrounding a female ancestor whose name keeps changing, making it hard to find her and pin her down. On the page, it refers to Johannes being the same person as Johann Christian, who went by both names. The post links to a thoroughly researched history of the Stutzmann family that also states Johannes and Johann Christian are the same person. I cannot independently confirm this information, but all the circumstantial evidence points to this being true...and my gut is saying that the place of Asselheim, the name and dates for Peter, double-checking for myself much of the sourced information on the page, my personal knowledge of other ancestors who went by various, unconnected names willy-nilly, and the DNA connections all point to this Stutzmann family being MY Stutzmann family...and They. Are. From. Switzerland!!! I fell in love with Switzerland the very first time I went there - I thought it was the most beautiful place I had ever been. And I still feel that way. I wanted to move there some day...and maybe now I know why my spirit felt at rest and happy every time I was there! 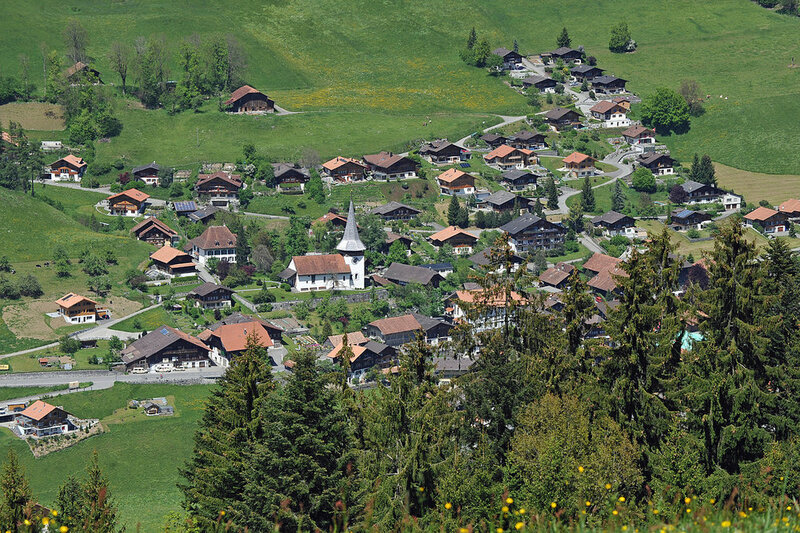 Anyway, specifically, the Stutzman family hails from Erlenbach im Simmental, Bern Canton, Switzerland, not far from Geneva and Bern. I won't go into all the history here, as both DNAeXplained and the Stutzmann book linked in that post do it much more thoroughly than I ever could, but apparently there were Stutzmann branches that ended up in Alsace, France; others ended up in Germany for many generations, including my branch that moved to Asselheim and then Grossbockenheim, and while my branch wouldn't join their cousins in America for another 120 years, one of the German branches, including my 1st cousin 9x removed, Johann Jacob Stutzmann, embraced the Amish, Mennonite, and Brethren faiths and moved to Pennsylvania, a state in which I now live, a place I was partially drawn to by the large German culture and population. I found out today that my 1st cousin 9x removed, Johann Jacob Stutzman, briefly owned property in a tiny place in now-Berks County called Maxatawny, along the Saucony Creek, now located in Kutztown, Pennsylvania. I didn't have to double-check that information, because I spent the last year driving through Maxatawny every day on the way to pick up my daughter at her pre-school in Kutztown, where on nice days, she and her teacher and classmates would take walks along the Saucony Creek. That's right. Almost 300 years after the fact, my daughter walked along the same waterway her cousin did. I've always felt very deeply rooted to my family, which is why I was sad to move last year from the place my English ancestors had settled and lived in for over 360 years...only to find myself ending up living in a place touched centuries ago by another branch of my family. Amazing. Amazing to be following in my family's footsteps. Amazing to finally put a decades long mystery to rest as to whether or not my Stutzmanns were related to the Swiss Stutzmans. And amazing to find out that a huge chunk of my tree that I thought was just "boring" German (I jest - my spirit is German and I love my German heritage) started out as "exotic" Swiss!